The Empire is vast, ancient, cultured, powerful–and in deadly peril, from enemies without and within. The luxury-loving court ignores all signs of danger, consumed by corruption and treachery. 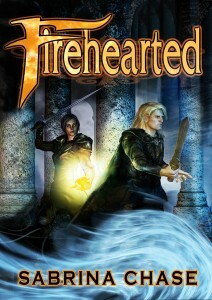 Exiled to a deserted border outpost, swordnoble Ronne tes Arhi is powerless to intervene. While her food supplies dwindle, she waits for the end — until she finds a dying barbarian warrior, outcast from his people. Thinking it will never be discovered, Ronne gives him shelter. But then the man’s mortal injuries miraculously heal…. With the aid of the barbarian, Erith, Ronne discovers the Empire was betrayed — and its enemies have awoken a malevolent magic long absent from the world. Ronne, Erith, and the few remaining loyal soldiers of the Empire will need all their battle-tested skills — and trust in their own new-found magic — to fight the evil and keep their people free. This was the first novel I ever completed. It was a bit of a revelation, in that I had always heard I should break in as a writer doing short stories, and only write a novel when I had a few published stories to brag about. Well, it turns out I struggle to write short stories–it just isn’t my natural length–and books are (comparatively) easy. So, I have written more books than short stories. I enjoyed everything about this book. The world the author has built is unique and very compelling. The clashes of culture, from the opening scenes where the barbarian and woman warrior can barely communicate due to their differing world views, to the constraints placed on both when they return to the warrior’s homeland are just one of many aspects of the book I enjoyed. Equally interesting is the development throughout the book of the back-stories of these cultures, the “magic” system (such as exists), and the unfolding of the history of the world that predates the cultures of the present era and that is influencing the conflict that now has arisen. The book moves at a brisk pace throughout; no dull moments here. Yet it does so in a way that is logical and unrushed and not at the expense of character development. While this is not a strictly military-focused fantasy novel, the descriptions of combat, both by individuals and massed armies are well presented. Speaking of character development, in my opinion it is likewise excellent. The two primary characters are fleshed out nicely. We understand their motivations. Neither of the primary characters is infallible. Neither is a Mary Sue. And as the two grow to respect and rely upon one another, while one might anticipate a certain romantic element to appear, as it does it is unrushed and it is left to the end of the book to resolve itself (and notice I didn’t say how it was resolved). No bodice-ripper here masquerading as epic fantasy, thank god. I wish this book had been longer: a duology or a trilogy. There I said it. I actually wish a fantasy book had been longer and spread over two or three books.